The astonishing results of Plus500 in the first half of 2018 have grossly exceeded broad industry trends. Indeed, brokers have had a blast in the first half of the year, however nowhere close to the blowout $465.5 million of revenues which the London-listed brokerage posted. While industry trends have been actively supporting growth during the first half of the year, brokers are now facing new challenges. This has been the market’s focus after Plus500 announced a second consecutive quarter of strong results and its management highlighted the one-off effect of new regulations on the firm’s revenues. Looking at the highlights from the earnings report we see an obvious connection between the cryptocurrency boom and Plus500’s revenues. After the company acquired a record number of new clients in the fourth quarter of last year thanks to crypto traffic, the bust of the bubble netted the firm a blowout figure in Q1. Albeit the second quarter wasn’t that massive, the firm’s KPI’s have been impressive on a year-on-year basis. Before the earnings report, shares of the company traded above 2060p and sharply dipped close to 20 percent towards the 1600p mark before stabilizing around 1814p as of writing. For the first half, Plus500 on-boarded 94,148 new clients, bringing its active clients count to 248,564, which is a 121 year-on-year percent growth. Plus500 was also operating with a 75 percent margin, which is unheard of in the industry. So why did investors chose to take profit in the aftermath of the results? We will try to answer this question in the lines that follow. In the words of the management of Plus500, the topline number of $465 million was above the firm’s own expectations at the start of the year. “It’s an amazing year for us as we upgraded our earnings estimates three times. We didn’t expect that the 75 percent margin is something doable, but its not sustainable. We are targeting a number closer to 65 percent with the additional operations in Singapore and other markets,” Plus500’s management stated during the H1 earnings call. The main reason for this, as the chart below shows, is cryptocurrency volatility. For the first time ever, Plus500 has published a detailed geographical breakdown of revenues. As it turns out the firm’s highest value users are from outside of Europe, with the “Other” segment revenues per client netting to $2701. The company has highlighted that only around 29 percent of the firm’s revenues come from outside of the European Economic Area (EEA). At the same time, only five percent of Plus500’s customer base has become among the elective professional clients. Nevertheless, these clients represent about 20 percent of Q2 revenues within Europe. The company has also detailed the number of customers who are losing while trading with Plus500. With the total customer loss ration netting 80.6%, 8 percent of clients lost less than $20, with another 39 percent of those losing $350 or less and 50 percent $650 or less. In the meantime, the average profit of clients that were in the green was close to $1,000. The publication of the chart of the most profitable days for Plus500 in recent months which we have provided above highlights the impact that cryptocurrency trading had on the firm’s bottom line. As usual, retail investors have been on the wrong side of the pond when it comes to volatile markets. A key slide in the earnings presentation of Plus500 shows that the company is generating the majority of its revenues from clients which are with the company for less than a year – around 63 percent%. While the remaining 37 percent are with the firm for longer, the shifts to the business model of brokers due to ESMA could cause major shifts in the coming months. 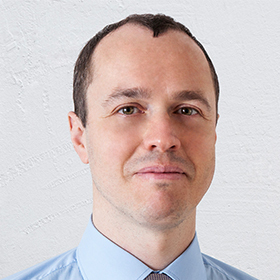 The reduction of leverage to 1:30 on major FX pairs and to even lower across indices is likely to have an impact on the life-cycle of clients. Industry experts have shared data which suggests that the speed of losing money on the market is expected to decline significantly. The mobile app of Plus500 has been rated as number one both on the App Store and on Google Play. The company’s app has been the main driver for the acquisition of new clients with around 60 percent% of new signups flowing in via mobile. Looking at revenues, 76 percent of revenues have come from mobile devices. 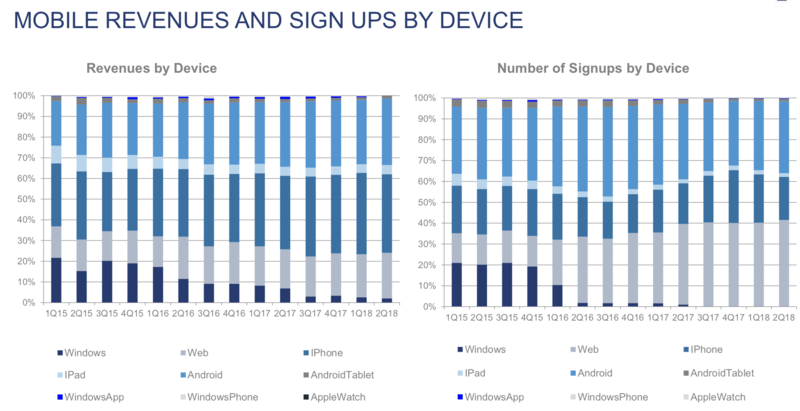 Looking at the composition of revenues, while Android sign-ups have taken a bigger share of new account openings, iOS users are generating much more revenue. The second quarter of 2018 has been somewhat of an outlier as the number of web signups increased somewhat. 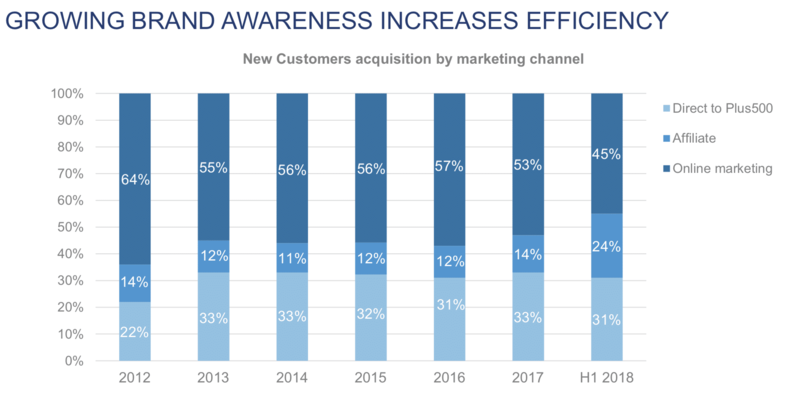 Plus500 is consistently accelerating the company’s marketing spend. The company has shown as a reference from 2014 when it invested $61 million into marketing for a return of $267 million. The firm appears to be on track to surpass its marketing spending in 2018 (currently at $64.8 million for H1) as the new regulations make the retail brokerage business more competitive. “Behind the scene we know how much we spend during the year. We also know the potential value of these customers. Statistics are specific [sic] based on region, keywords, etc,” the team elaborated. 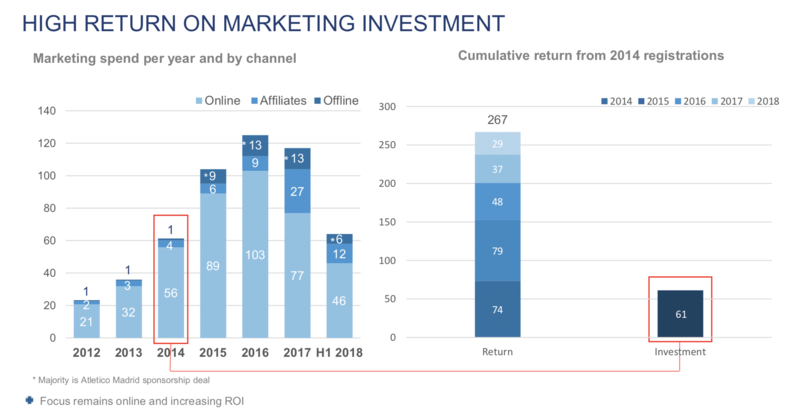 As we see from the final slide we picked for this analysis on display below, the company is also increasingly using affiliates to drive traffic to the platform. The rising AUAC (Average User Acquisition Costs) seen across the industry in recent months into the ESMA deadline show that the drop in the price to $677 might be temporary.